I've come close to buying a Sub a couple times, but kept ending up with something else. Today after some deliberation between the TT Sub, green sub & a Daytona, I walked out with a new blue TT Sub. I've always liked the blue, and while I'm not a huge yellow gold fan, I think it works well on this watch and sets it apart from the more traditional SS professional watches. My AD had 2 blue subs in stock, the lighter monocromatic blue and the slightly deeper blue, which I opted for. It's just slightly more subtle and really grabs the light. 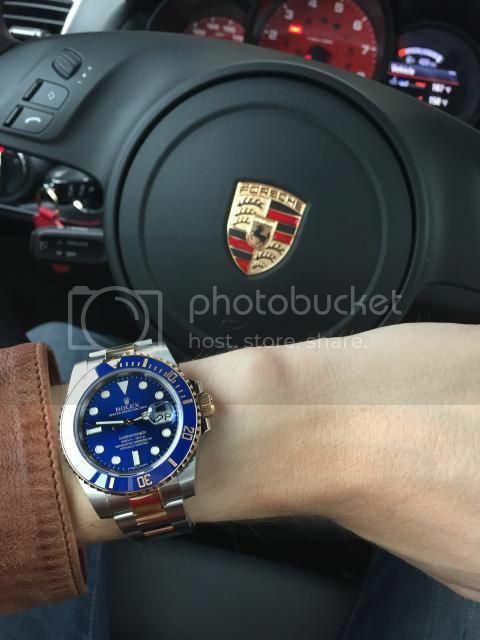 Previous Topic: What Rolex are you wearing today? Next Topic: Happy Halloween, what's everyone wearing?